One of the most important components of a home’s structure is often the one thought about the least. That is, until there is a problem on that component then most home owners realize just how important it is. The part that’s so important is the roof on a home and if your roof needs repair then you may be in for a surprise the next time it rains. Of course, getting roof repair in Pinckney Michigan on your home before any damage can occur inside the home is ideal you’ll need to know some of the signs that your roof is in need of repair. In this article I’ll discuss some of the most common signs that your roof may be ready to leak at any time and more importantly, what you can do about it. Many times home owners will never think about the shape of their roofs. Although we may walk under the roof each day it’s not common to actually look up at your roof and look for damage. In fact, it’s probably difficult to remember the last time you actually looked at your roof. No matter what shape your roof is in I’ll give you some tips below that can help you identify problems on the roof and if needed, getting a roofing contractor in Pinckney Michigan to come out and do a roof inspection on your home. 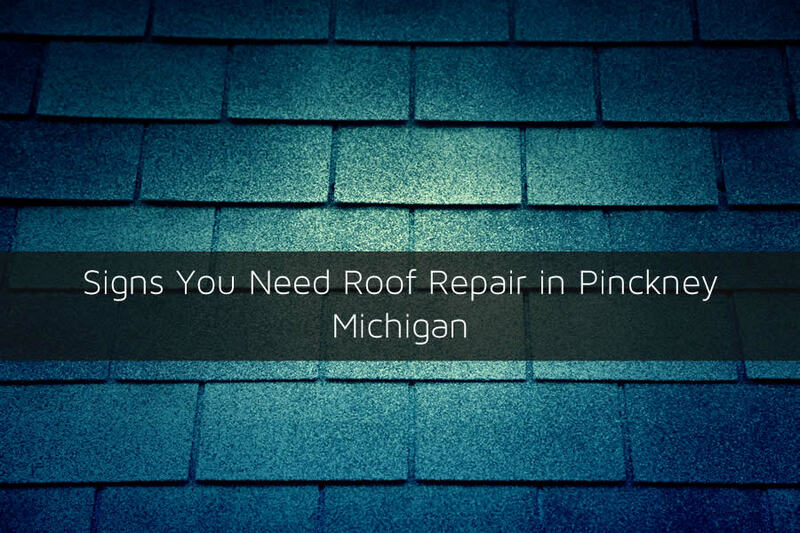 Even if you have a new roof some of these problems can occur on your home’s roof and should be considered for roof repair in Pinckney Michigan if needed. The roofing materials on your home are designed to last for decades in some cases of course it is determined by the actual roofing materials that are installed and the quality of those materials. Some lower quality roofing materials are only designed to last about 15 years and may fail soon after. While there are higher quality materials that can last 40 years or more. Determining the quality of shingles or roofing on your home can certainly help. If you’re unsure about the age of your home’s roof there are still some signs that you can look for that may be an indication of it’s age. The first problem you may see on your roof is the shingles are not laying flat and may even seem to look bent in the middle. This is a really bad sign for your roof because the shingles will allow wind to get under the shingle and may cause breaking of the shingle which will certainly need roof repair on your home. Another problem that may be happening on your roof is it’s getting damaged by storms. This is usually done in the summer months because of higher winds that may be able to move and break shingles from the roof. If you notice shingles pieces that are on the ground around your home or dark spots on the roof where the shingle is missing from then chances are you have storm damage on your roof. Damages from storms are more prominent in the summer months but can happen in colder months as well. If you notice problems with broken shingles then you’ll need to get roof repair on your home quickly in order to prevent a roof leak developing. Although looking at your roof may seem like you should climb on top of your home it’s certainly not advised. Going onto the roof is dangerous and should only be done by professionals. Many times you can see problems on the ground simply by going over your roof every so often. Look for visible problems on the roof such as debris buildup, broken shingles, and things that just look out of sorts. If you suspect there is damage on the roof be sure to get a roof inspection done on your home. If you think your home may need roof repairs in Pinckney Michigan or the surrounding areas be sure to call us at 517-940-8770 to schedule a roof inspection for your home. Livingston Roof Pros is a fully licensed and certified roofing contractor in southeastern Michigan.